Chemistry: (Fe, Mg, Mn)3(PO4)2 - 4H2O, Hydrated Iron Magnesium Manganese Phosphate. Ludlamite is a classic phosphate mineral. Known from only a few localities, it is most famous from the classic Wheal Jane Mine in Cornwall, England. It was first discovered there (1876 - 1877) after the old mine had been reopened. The mine was closed for a long time until recently reopened in the past three decades and was again producing some ludlamite specimens. Ludlamite is named for Henry Ludlam, a British collector of fine rare minerals. Specimens of ludlamite are extremely beautiful. They are characterized by a bright green, usually apple-green color, a vitreous luster, and an interesting crystal habit. The aggregates typically form into sprays of jaggedly pointed sheaves that are pinched in the middle like sheaves of wheat. To own a specimen is truly a blessing for a mineral collector. Colors include a few shades of green, often bright apple green or colorless. Crystal Habits include tabular almost pseudo-octahedral crystals also as jagged, crystalline masses and aggregate sprays or sheaves. Hardness is 3 - 4. Specific Gravity is approximately 3.1 - 3.2 (very slightly above average). 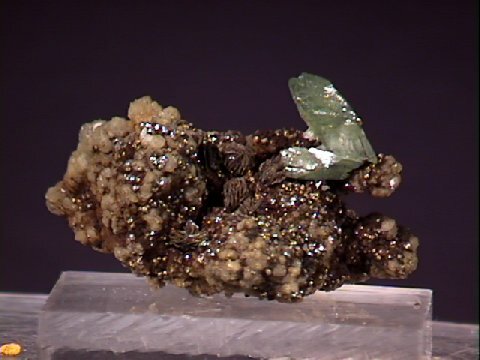 Associated Minerals include pyrite, limonite, siderite, triphylite, vivianite and other primary and secondary phosphates. Notable Occurrences include Wheal Jane Mine, Truro, Cornwall, England; la Union, Spain; Rapid Creek, Yukon, Territory, Canada; Chihuahua, Mexico; Hagendorf, Germany; Cobalt, Idaho; North Groton, New Hampshire and Custer County, South Dakota, USA. Best Field Indicators are crystal habit, color, locality and cleavage.